This left facing, ½ length portrait shows Mrs Walker (aged 37) in mourning for her elder brother, John Marquet Blaxland (1801-1840) who died suddenly on 29 May 1840. The landscape view stretching behind her could be a reference to her home in Tasmania and/or her place among colonial Australia’s first generations of landed gentry. Mrs Walker’s recent bereavement is signified by her choice of black garments, further accessorised with appropriate memorial jewellery in the form of jet pendant earrings and an enamelled mourning brooch containing plaited hair of the departed which she has pinned to her corsage. The sheen of the gown suggests it is made of black [silk] satin, rather than the lustreless black materials favoured for mourning after the death of Prince Albert in 1861. It follows the fashionable silhouette for the 1840s, with its shallow, demure wide neckline just revealing the edge of a sheer white chemise, above a fitted bodice trimmed with a series of flat tucks fanning up over the corsage in a V-shape from the pointed waist. The sleeves appear to be tight-fitting at the shoulder with rows of flat tucks over the upper arm, confirming a post-1836 date, and becoming more voluminous below the elbow. Her judiciously draped Turkey red [paisley] shawl is thought to have been a family heirloom and serves a double purpose by concealing Mr Walker’s advancing pregnancy – her fourteenth, and last child, Alice, was born soon after her return to Tasmania, in early 1841. She wears her centre-parted dark hair with a knot at the back, her long side ringlets held in place with black [jet] hair clips, or barrettes. Thomas Walker arrived at Port Jackson on 13 January 1818, and subsequently built a house at Concord, on the Parramatta River, which he called Rhodes. On 4 January 1823 he married Anna Elizabeth (1804-1889), second daughter of John Blaxland at St John’s Church, Parramatta. The couple had four sons and nine daughters. In 1832, the Walkers left Sydney to make their home at South Esk, near Longford, Van Diemen’s Land (now Tasmania) at the property they also named Rhodes. In late 1839/ early 1840, Anna Walker travelled with her husband and four of her thirteen children up to Sydney from her home in Tasmania; the unexpected demise several months later of Anna’s elder brother, John, extended the Walkers’ visit til November/December. As neither of Felton’s portraits of the Blaxland siblings is precisely dated by the artist (and only one is signed physically), it is possible only to ascribe approximate dates, ie. after the sudden death of John Marquett Blaxland on 29 May 1840, in his 39th year, at Newington, Sydney, and before Anna’s return to Tasmania. The sombre mood of the portrait would seem to bear out this conjecture. Naval surgeon and artist Maurice Felton (1803-1842) arrived with his family at Sydney in late 1839. 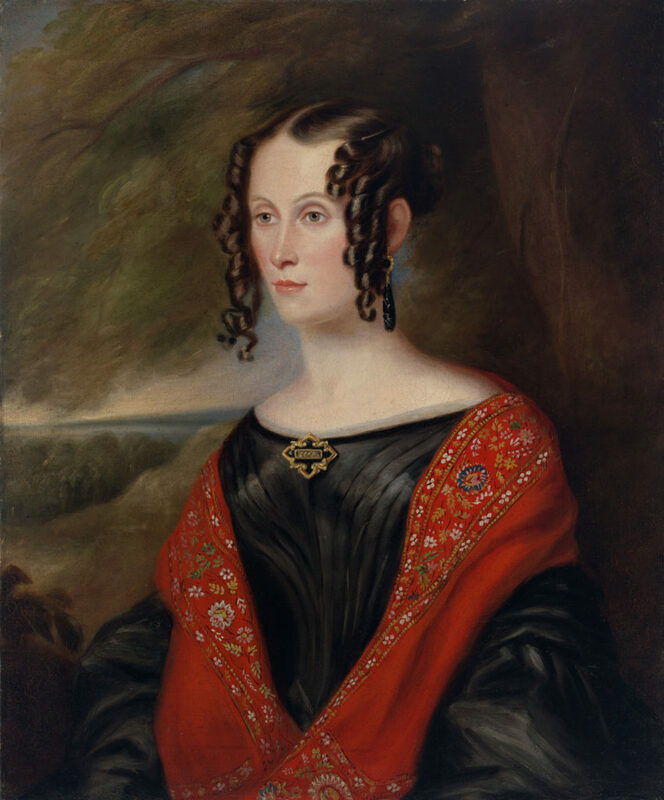 He staged his first colonial exhibition in January 1840, perhaps leading Thomas Walker (1791-1861), commissary and settler, to commission this portrait of his wife Anna (nee Blaxland); Felton’s other known portraits of the Blaxland clan include Walker’s father and mother-in-law, John Snr and Harriott de Marquett Blaxland, and John Marquett Blaxland (1801-1840), their eldest son (ML 423). It is also possible that this work may have been commissioned by Mrs Walker’s parents. Subject is posed with landscape view stretching to the horizon behind her, perhaps indicative of her home in Tasmania.